In July 1955, construction on a 160-acre site in Anaheim was picking up at a hurried pace. Disneyland would soon premiere with a grand invitational preview, as national attention was drawn to this first-of-its-kind amusement enterprise. Yet amid the oversight and coordination of tireless designers, carpenters, painters, and landscapers, a restless Walt Disney found a rare moment to celebrate and reflect on his team’s efforts—and the life partner who stood by his side through each bold idea and risky new endeavor. July 13 marked the 30th wedding anniversary of Walt and Lillian Disney. 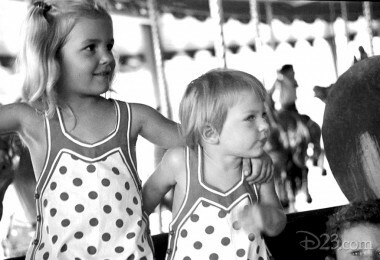 From the mid-1920s, when Lillian joined the staff of the Disney Brothers Cartoon Studio, to the eve of a Magic Kingdom’s unveiling, the smitten couple had started a happy family and the Disney name had become a household word synonymous with family entertainment. 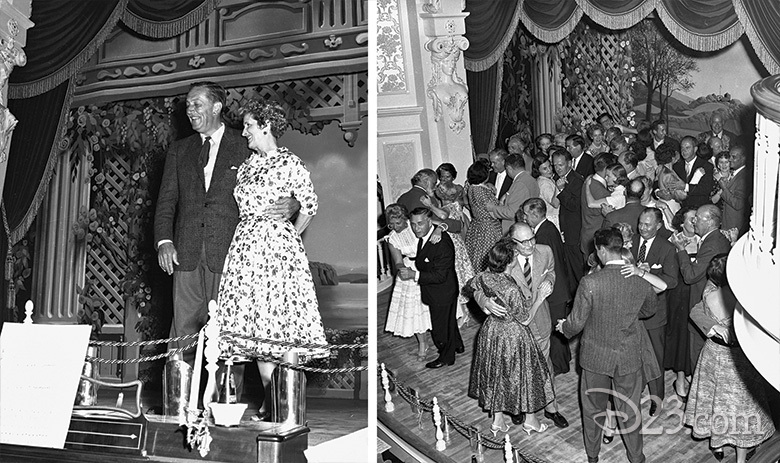 To celebrate their marital milestone, Lilly and Walt threw a party at Disneyland—four days before the first official guests would enter through the park gates. A whimsical invitation uniquely caricatured the couple. How: …by cruising down the Mississippi on the Mark Twain’s maiden voyage, followed by dinner at Slue-Foot Sue’s Golden Horseshoe! Just before the party, Admiral Joe Fowler ran into a familiar face while inspecting an attraction. Admiral Joe Fowler—who oversaw the park’s construction—arrived early that Wednesday to inspect the Mark Twain before its maiden voyage and encountered someone who alerted him to the ship’s “filthy” state. 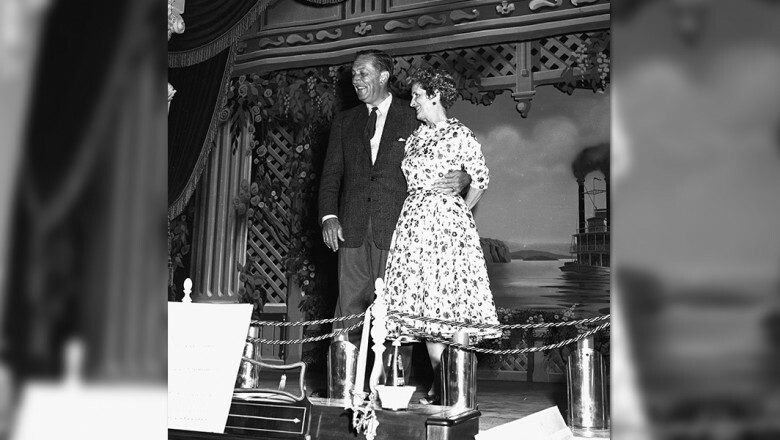 Together, Lillian Disney and Joe began sweeping the decks, ensuring the riverboat would be ready in time for its first guests! After working all morning, Walt and Lilly welcomed their first guests to Disneyland in grand style. Walt, having overseen park construction all day, took a much-needed pause and joined Lillian to welcome their guests. 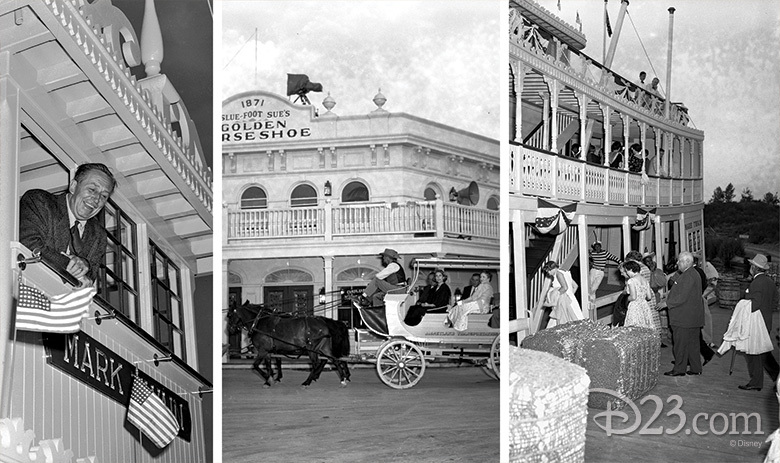 Traveling down Main Street, U.S.A. in surreys, lucky invitees gazed at the wonders of a nearly completed park. The sounds of a Dixieland band accompanied guests as they entered Frontierland and boarded the Mark Twain, where Mint Juleps were served on the milestone voyage. 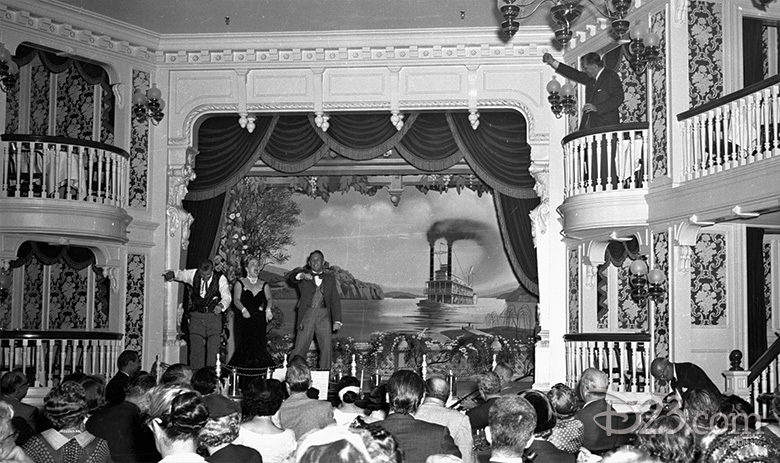 After their journey along the Rivers of America, guests gathered inside the Golden Horseshoe Saloon for a buffet dinner and to enjoy the musical talents and comedic antics of Wally Boag, Donald Novis, and the original Slue Foot Sue, Judy Marsh. But it was actually Walt who stole the show, leaning over a balcony and interacting with the performers. 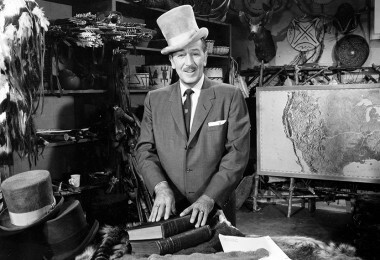 Climbing down onto the stage, Walt’s enthusiasm was met with eruptions of applause and calls for a speech. 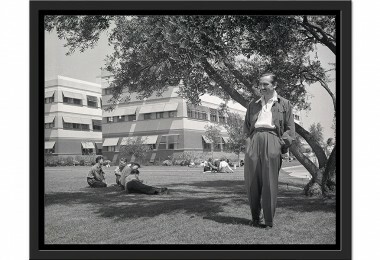 Walt enjoyed a rare rest before resuming work the next morning. A well-deserved time to relax and reflect on the importance of his family… and, perhaps, the history that would be made in just a few days. 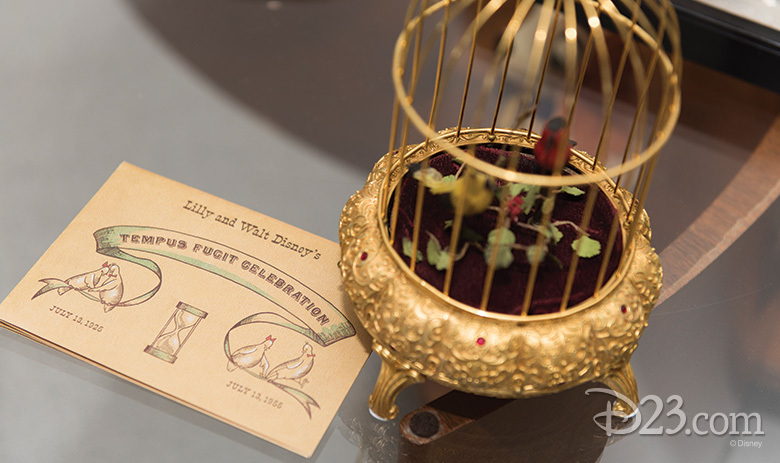 When D23 Gold Members open their 2016 D23 Member Gift, “From the Office of Walt Disney,” they’ll discover a re-created invitation to Walt and Lillian’s 30th wedding anniversary party inside. 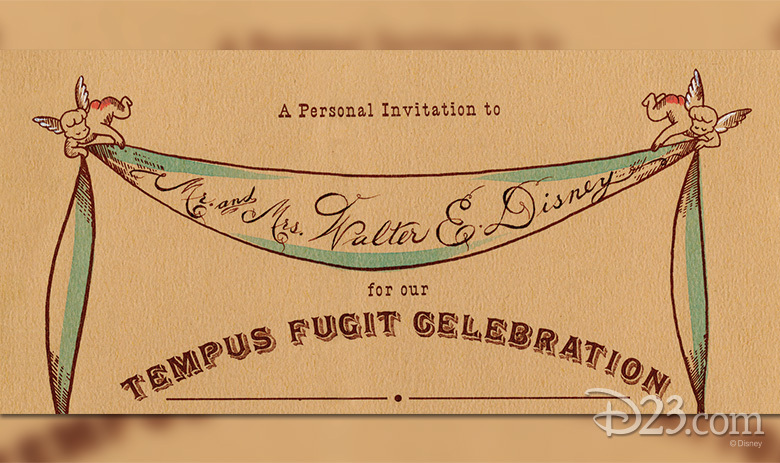 The card is a reproduction of the couple’s personal copy, with Walt and Lillian’s names lettered into the banner containing the names of invited guests. This invitation is one of 23 reproduced treasures from the Walt Disney Archives, celebrating major milestones in the life and career of Walter Elias Disney. To learn more about this first-of-its-kind collection, visit D23.com/OfficeofWaltDisney.